The Lawrence Journal-World is a 12,000-circulation paper out of Lawrence, Kan. Previously, the team had invested a lot of energy into growing its engaged database through promotions, but now they wanted to put this database to work. The team at the paper was preparing to launch its first digital subscriptions initiative for LJWorld.com, with the goal of creating a sustainable revenue stream for the future of the newsroom. They planned to leverage both a traditional paywall as well as a robust email campaign. Having the advantage of studying many subscription launches before theirs, they knew email would play a large role in their efforts. But, they were still surprised by how effective it actually was. 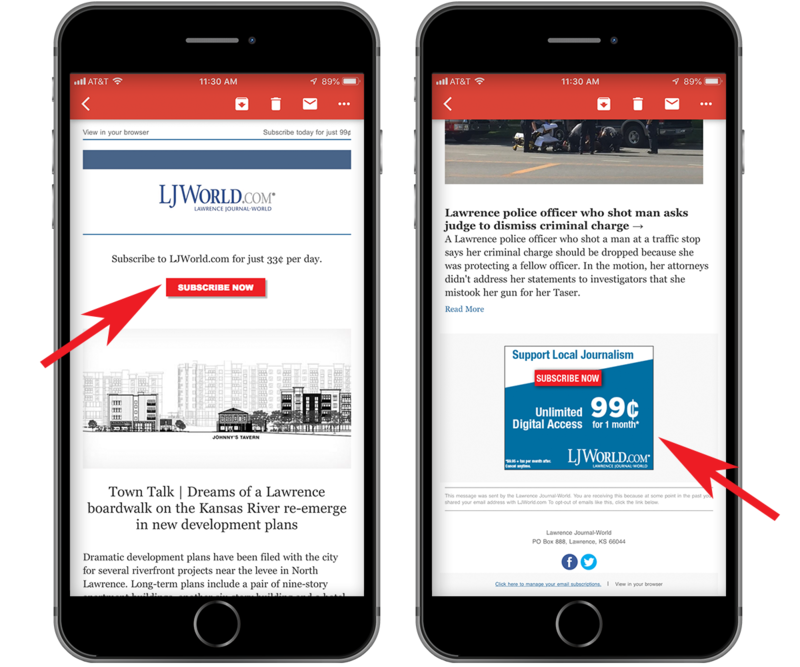 The Lawrence Journal-World set out with a two-pronged approach to use email to grow digital subscriptions. The first part was an email campaign to non-subscribers, and the second was the chance to offer an email newsletter as an added bonus to subscribers. The goal was to be strategic with their efforts. They leveraged the circulation system to cut out known print subscribers and coupled that with their email provider to determine current engaged email subscribers. This gave them a rich, engaged list of people to email. Next came the email itself. They didn't want to just send out an offer email for a subscription – they knew their content provided the most value and decided to leverage that instead of a simple offer. By using their analytics, they identified the week's most popular stories and created a weekly recap to send out to their list. They began to see the impact of this almost immediately. On days this email was sent out, subscription sign ups were double the daily average. By simply including a call-to-action for subscriptions at the top of the recap emails, digital subscriptions began to grow. Plus, they were getting even more traffic to the site as readers clicked through to the stories in the email. Putting a big focus on email and newsletters meant the Lawrence Journal-World team also had to step up its game to design emails that users would find value in receiving. While many companies neglect the Welcome Email (some don't even send one), they really wanted theirs to set the stage for introducing the paper's digital content to new subscribers. By the time they were done, the paper had taken a look at the entire email program and made updates and tweaks to ensure the staff was putting its best foot forward across the board. The Lawrence Journal-World achieved its first-month goal for new subscriptions in just nine days. When they had initially set their goals for the paywall, research had lead them to believe that 85 percent of their new subscriptions would come from the paywall. But in reality, the results from the first two months of the paywall are much lower. Instead, more than half (53 percent) of the new subscriptions are attributed to email marketing efforts. The publisher went into the office of Allison Wilson, the director of marketing and digital advertising, just minutes after the first emails were sent and said, "We've had seven sign ups that didn't come from the paywall – your email is working!" 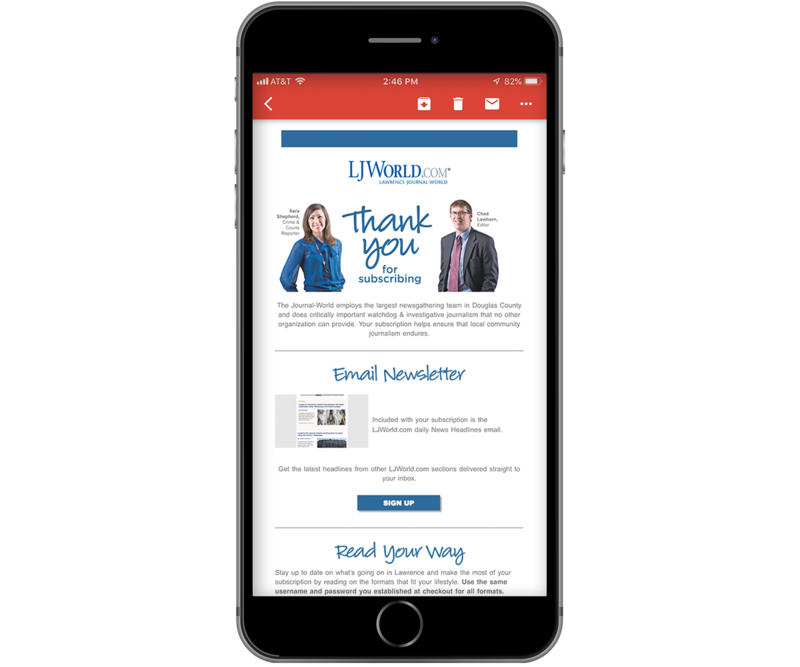 The team at the Lawrence Journal-World is excited to improve and expand its email campaigns in the coming months to continue its success in reaching the paper's digital subscription goals.